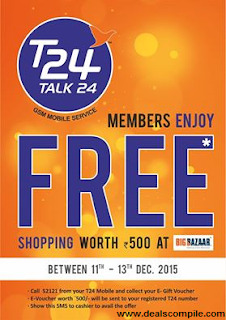 - T24 Mobile Members enjoy Free Shopping worth Rs. 500 at Big Bazaar. 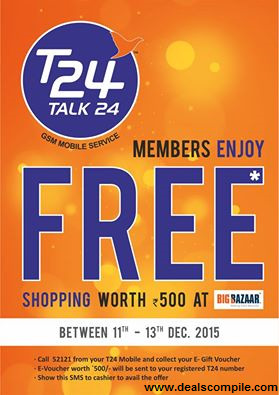 - Call 52121 from your T24 Mobile and collect your E-Gift Voucher. - E-Voucher worth Rs. 500 will be sent to your registered T24 Number. - Show this SMS to cashier at the Big Bazaar outlet to avail the offer .